What's this? The long awaited specs for Intel's third generation SSD? Indeed. Internally it’s called the Postville Refresh (the X25-M G2 carried the Postville codename), but externally it carries the same X25-M brand we’ve seen since 2008. The new drive uses 25nm IMFT Flash, which means we should get roughly twice the capacity at the same price. While Intel is sampling 25nm MLC NAND today it's unclear whether or not we'll see drives available this year. I've heard that there's still a lot of tuning that needs to be done on the 25nm process before we get to production quality NAND. The third generation drives will be available somewhere in the Q4 2010 - Q1 2011 timeframe in capacities ranging from 40GB (X25-V) all the way up to 600GB. Despite the Q1 release of Intel’s 6-series chipsets, Intel is listing the new X25-M as being 3Gbps SATA only. The SATA implementation has been updated to support ATA8-ACS so it’s possible we may see official 6Gbps support once Intel has a chipset with native support. Form Factors 1.8" & 2.5" 1.8" & 2.5"
If these numbers are accurate, the new Intel drive should be roughly equal to Crucial’s RealSSD C300 and SandForce SF-1200 based drives. There are many different ways to measure this data however so the numbers may be higher or lower in our tests. Note that performance could also go up by the time drives are available as there's still a lot of tuning going on right now. I'd say that at these performance levels Intel had better be very aggressive with pricing because I'm expecting much better from the next-generation SandForce drives. Write amplification appears to be more under control with the third gen X25-M. Intel upgraded the total 4KB random writes spec from 7.5TB - 15TB on the G2 to a much higher (and wider) range of 30TB to 60TB depending on drive and spare area. Intel hasn’t disclosed any information about spare area, but given the huge increase in longevity of the drives I suspect that spare area has gone up as well (at least on the larger drives). The G1 and G2 drives didn’t store any user data in the off-controller DRAM, the third gen drive changes that. A large part of why the C300 is so quick has to do with its large external DRAM, something Intel has avoided implementing in the past due to the associated risk of data loss. Intel refers to the 3rd gen X25-M has having a power safe write cache, which sounds to me like it has an external DRAM paired with a big enough capacitor to flush the cache in the case of sudden power loss. Full disk encryption is the next big feature on the Postville Refresh. You get AES-128 support on the consumer drives. I’m guessing there’s a new version of the SSD Toolbox in the works as Intel is also promising Windows based firmware updates. The new X25-M will be available in both 1.8” and 2.5” versions. The 1.8” drive tops out at 300GB, you’ll need the 2.5” form factor for 600GB. In addition to the new X25-M there’s a new X25-E due out in Q1 2011. 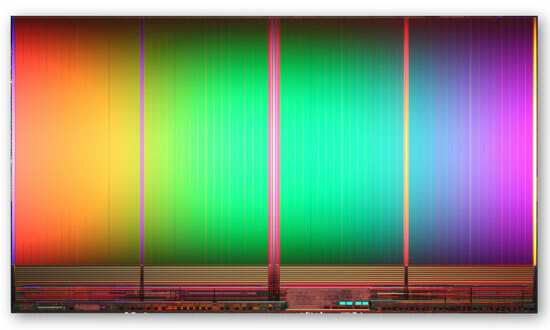 Codenamed Lyndonville, this will be the first Intel Enterprise SSD to use MLC flash. It’s not quite the same MLC used on the consumer drives but rather a modification of the 25nm process that trades data retention for longevity. Standard MLC will last for 12 months after all erase/program cycles have been consumed. Enterprise grade MLC will last only 3 months after exhausting all erase/program cycles but will instead support many more cycles per cell. Larger capacities, higher performance, AES-128 support and comparable lifespans to the old X25-Es are all in store early next year. Note that Intel tests 4KB random write performance differently on enterprise vs. consumer drivers so you can’t directly compare the numbers between the X25-M and X25-E. The X25-E will be 2.5” only. Intel isn’t the only one working on a controller update. SandForce and Indilinx are both heading towards production versions of their next-generation controllers. I expect we’ll see preview class hardware before the end of the year, with mainstream availability in Q1 2011. ==> Now, if the SSD TRIM this #0, what would be the 4KB values read from the first 64KB stripe for my 3rd small file to be written ? Anand, for your next SSD tests, please do some full-disk encryption test and see how it affects performance. I have an Intel G2, and using TrueCrypt full disk encryption, I only get 40-45% of the read and write performance. I'm also a little disappointed encryption hasn't been tested at all. SSDs make a lot of sense in laptops, and it's in those setups you're likely to see full disk encryption. Won't encryption be processor limited as opposed to depending on the SSD?